A Fantastic group of people recently cooking at the Garioch Community Kitchen from Grampian Opportunities. We thought we would share some of the great comments that we have received from the various groups who regularly use the kitchen. “It was my very first time at the kitchen. Its a great facility. I found it very interesting and enjoyed seeing the interaction between the parents and children”. 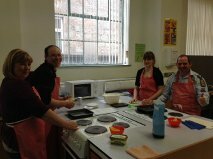 Very good – client group really enjoyed their cooking sessions. Great course loads of good advice when I am planning my cooking classes. Kitchen – excellent! Was a good day and learned a lot about healthy food and how to put a meal together with few ingredients. More confident to try new things – practice what I preach.